Click here >]:::|- for a schematic diagram of the AA5 AM radio using miniature tubes. Foreign to AA5 or audio tube sub list. Military to AA5 or audio tube sub list. Possibly the longest lived consumer electronic product design was the five tube "AC/DC" AM radio. Virtually every household had at least a few over the years. These radios were low cost, and one expensive item designed out was the power transformer. Thus the series heater string, and using the powerline directly rectified for B+ power. No power transformer also made it possible for smaller and lighter sets to be made. In the 20's the crystal set and then the Tuned Radio Frequency, or TRF, set would provide adequate performance. The complexity and cost of the Superhet receiver was simply not required. As a result, the Superhet design appeared only in the most expensive receivers. 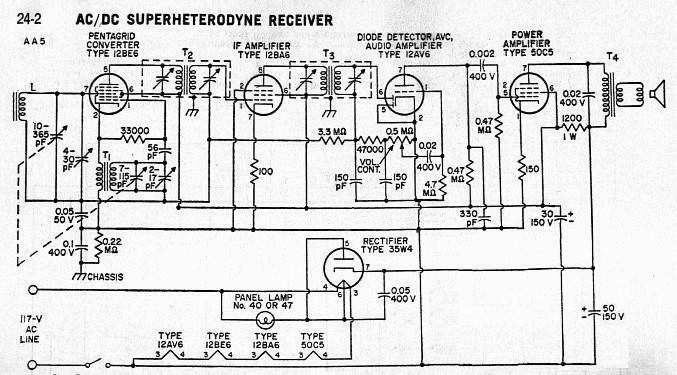 See a brief description of the Superheterodyne radio. In the 30's, the situation rapidly changed. Radio had enjoyed explosive growth and the number of transmitters on the air exceeded the selectivity of the TRf sets. The 30's also saw an extraordinary economic circumstance and the manufacturers of radios realized the need to produce low cost, high performance, receivers. It was now evident the only design that would provide adequate performance was the Superhet. In order to reduce the number of tubes required to support the Superhet, manufacturers designed multipurpose tubes. In April 1933, RCA introduced the 2A7. The 2A7 was the first pentagrid converter which combined the functions of Rf amplifier, mixer, and oscillator in a single envelope. This tube could then be used with a pentode as an If amplifier, a combination diode-triode as a detector-first audio amplifier and a audio power amplifier to make a complete receiver. Add to this a rectifier to power the set and you have a high performance receiver with but 5 tubes. To further improve the receiver, a remote cut off pentode could be used in the If amplifier so the If amplifier could be used as a part of the automatic volume control circuit. The tube line up for this 5 tube receiver would then be: 2A7, Rf amplifier, converter; 58, Remote cut off pentode, If amplifier; 55, Diode-triode, Detector-first audio; 59, Audio output; and 80 for a rectifier. This arrangement uses 2.5 volt filaments and therefore required the use of a power transformer. This was the prototype "All American Five." 1934 saw the introduction of the 6A7 and a whole series of 6 volt tubes to go with it. It was now possible to build an automobile radio or to combine with a 25Z5 rectifier to build a set without a power transformer. (See the March 1990 Chronicle article, Ballast). With the elimination of the power transformer, it was now possible to have a truly low cost, high performance receiver. There are those who argue the series filament version became the classic all American Five. The tube heaters were wired in series, sometimes with a "ballast" resistance added to make the total voltage drop across the entire string add up to that of the powerline, around 120V. All the tubes needed to have the same heater requirement for this to work. All tubes had indirectly heated cathodes. Early versions of the five tube radio used the same small signal tubes (RF, IF, non-power audio) as transformer sets used. Tubes like 6A7, 6D6, 75, 6F7 and newer ones like 6SK7, 6SQ7. And an extra "tuning eye" 6E5 tube if desired (- George Gonzalez). All these had 300 ma heaters. To make an "AC/DC" radio, you would just need specially designed audio output and rectifier tubes. Like the 43, 25L6, 25Z5 and 25Z6. That would be only two new tubes to be developed (per radio chassis design) to make an AC/DC set. These had higher voltage heaters, but the same current (300mA) as the small signal tubes above. Power handling tubes like audio outputs and rectifiers need bigger cathodes and more heater power to operate. If current is the limiting design factor, increase the voltage to get more heater power. But all the heaters in a series string in the above didn't add up to enough voltage to be fed directly off the powerline. So some sort of additional voltage dropping resistance was used. Either a power resistor, "ballast tube" or resistive wire in the power cord was used. I don't know if anyone used a power resistor housed in a "wall wart" (calculator charger style) power plug. One of the above mentioned rectifier tubes, the 25Z6, is a pair of diodes, used in a voltage double circuit. This gets you a B+ of around 250 - 300 volts. Might make "translating" a design from a power transformer design to a "hot chassis" design. Not "AC/DC", voltage doublers won't work off of a DC supply. Later on, to reduce waste heat in ballast tubes or resistors, the 150 ma tubes were developed. By this time, the 5 tube AC/DC radio was a popular product, so it was worth while to create new tube designs. Basically, the 6V, 300mA heater signal tubes had their heaters replaced with ones that needed 12V at 150mA. "Tuning eye" tubes at 150 mA heater for consumer radios did exist. There's the 6AB5 / 6N5. Heater of 6.3V @ 150ma. And the 1629, heater of 12.6V @ 150ma. But they were rarely used. The Airline model 93WG602B used the 6AB5. But the common 150ma AA5 tubes used the same power as the 300ma AA5 tubes. And the 25L6 became a 50L6 the same way, 2x voltage, 1/2 current. A new design overall was the rectifier tube, the 35Z5, with a tap on the heater to operate a pilot light. And the total added up to the powerline voltage, so no wasted heater string current thru a dropping ballast. Saved 18 watts of power that used to be 18 watts of heat to get rid of. And conserved some energy, but noone worried about that until the mid seventies. It looks like this occurred in about 1940. All these were octal socket tubes. Loktal versions appeared at about the same time, also. So much for the heaters for now. Early sets were TRF's (tuned radio frequency) that just amplified the radio station's carrier frequency, detected it down to audio, and amplified it. This design would need to have 3 or so LC circuits that would "track" each other as you tuned across the band. And with gain stages between, you had to be careful that the amplified signal at the detector didn't leak back into the antenna, or else you'd hear yourself instead of a signal. Later on, the superheterodyne radio was invented, and is still the preferred architecture for modern radio receivers. A basic superhet receives the radio station with an antenna LC circuit, heterodynes it with a supersonic (thus "superheterodyne") locally generated frequency, and the difference of the station carrier frequency and the local oscillator would be the intermediate frequency (IF). After this conversion, a narrow fixed bandwidth and frequency gain stage was designed to amplify the signal. Easier to design such a stage instead of a TRF circuit of the same gain. It also helps that leakage form the IF won't be "heard" by the front end antenna LC circuit, because it's a way different frequency. Special frequency changing tubes were developed to generate and mix the local oscillator frequency with the radio station carrier to generate the IF. The 6A7, 6A8, and 6SA7, and later the 12SA7 are "pentagrid" converter tubes for this purpose. Tubes with variable gain were used in IF amp stages, so automatic volume control (AVC) could be done. Decrease the gain on strong stations so you don't get blasted out when tuning from a weaker station, and also avoid distortion overload from the strong station. Tubes like 6K7, 6D6, 6SK7, and later 12SK7 were variable gain tubes. Usually called "remote cutoff" pentodes, as the tube wouldn't linearly cutoff current flow like a constant gain tube ("sharp cutoff") would. Yes, these remote cutoff tubes would not be usable in an audio amp, but these tubes lived in IF strips, where only a narrow bandwidth of frequencies were to be amplified, and harmonic distortion products fell outside the bandwidth of the output IF filter, and were thus ignored. The audio detector tube would also measure the signal level, and thus could be fed back to the remote cutoff pentode IF tube. And also to any variable gain tubes at the front end of the radio. The audio detector diode was arranged to create more negative voltage for strong signals, and more negative voltage reduces the gain of the remote cutoff tubes. Once the audio is detected, it needs to be power amplified to drive a speaker at reasonable volume levels. A triode signal gain stage feeds the power tube, to generate about 1 watt of audio power to the speaker. The audio bandwidth is narrower than modern hi-fi stereos. And the speaker was fairly efficient, so not much power was needed. To a casual listener, if you limit the low frequencies and the highs at the same time, the listener won't really notice. The extreme example of this is the telephone, 300 to 3000 Hz. AA5 radios do about 150 to 5000 Hz. Hi-Fi stereos do about 20 to 20000 Hz. The five tube AM radio didn't much vary after the 150 mA heater tubes were introduced around 1940 or so. Those were the octal series of tubes. The 12SA7 converter, 12SK7 IF amp, 12SQ7 audio detector and signal amp, 50L6 audio power, and 35Z5 rectifier. Just after WW2, the miniature 7 pin tubes were introduced. 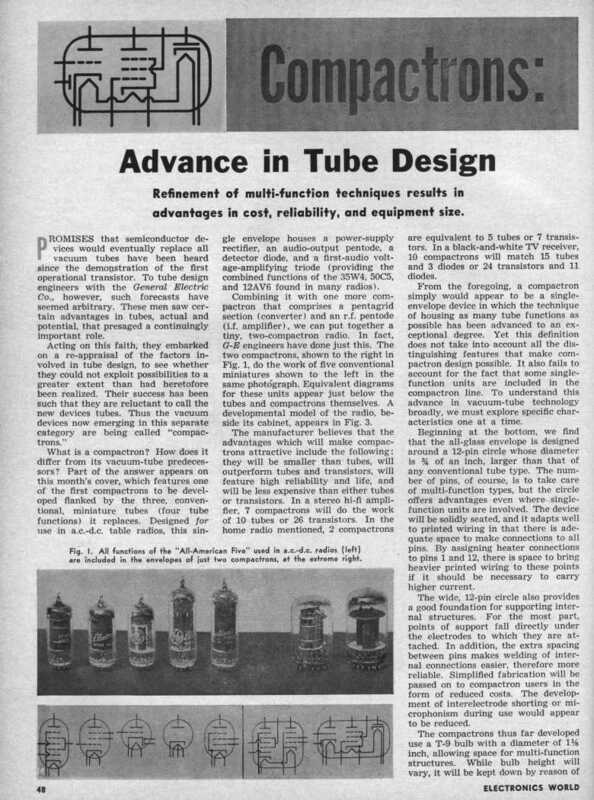 Miniature tubes were used in the war, but didn't hit the consumer market until after. The 12BE6 converter, 12BA6 IF amp, 12AT6 audio detector and signal amp, 50B5 audio power, and 35W4 rectifier. The 50B5 had its plate next to the heater, but that made for too much voltage between these pins and uL and similar safety agencies didn't like this. The 50C5 was a rearrangement of the pinout to solve this safety concern (- George Gonzalez.) Another variation, the "loktal" tube, had its own versions of these, 14Q7, 14A7, 14B7, 50A5, and 35Y4, respective functions. By this time, the AA5 acquired its designation, the "All American 5" from ww2 surplus tube dealers who sold to hobbyists (- Doug Houston). You sometimes find AA5 radios using a mix of octals and loktals, or octals and mini's. Doug MacDonald tells of an AA5 that used a mix of octals, loktals and mini's. A Philco 81-122, using 7A8, 12BA6, 14B6, 50L6 and 35Z5. Most likely reason for this grouping of tubes was what they could purchase enough of inexpensively to make radios at the time. The last version of the AA5 tube line-up was the 100 mA heater string, introduced in the early sixties. Saved an extra 6 watts of heater power, but the tubes took a little longer to warm up, and the audio output power was a bit less. The signal handling tubes were 18V at 100 mA heaters, so those used the same amount of power as the 12V tubes on the heaters. All had the same pinouts as the 150 mA versions. But these had slight differences with the 150 mA tubes, so they were assigned their own designations instead of being called 18BE6 or 18BA6. They were: 18FX6 converter, 18FW6 IF amp, 18FY6 audio detector and signal amp, 32ET5 or 34GD5 audio power, and 36AM3 rectifier (which the RCA tube manual (RC24) says cannot be used to operate a pilot light, but the Sylvania tube manual (1968) says it can operate a pilot light). As you can see, the audio out tube had less heater power than the 50V at 150 mA version had to heat the cathode, thus less audio power output. Also the rectifier was also had less heater power, but the audio stage drawing less current allowed a less current capable rectifier to be used. A compactron tube version was in development, but turned out it would have cost more to make than the miniature 7 pin tubes already out. 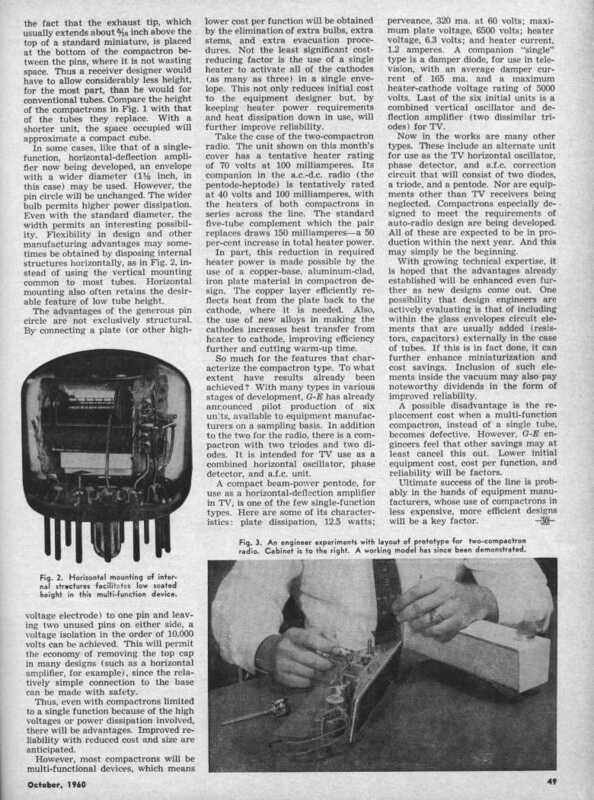 See Electronics World Oct 1960 article page 48 and page 49 on these. A radio would have used 2 tubes, a converter/ IF pentode tube "40xx10" (my guess at a likely tube number had it went into production) and a detector/audio driver & output/rectifier "70xx11". 100 ma heaters. The 56R9, a compactron triode and power pentode, is listed in the 1973 edition of GE's "Essential Characteristics" manual, page 212. With a heater current of 150mA, this may have been to be an "AA5" compactron. See a web page of an AM radio I built using compactrons. After you make a few tens of millions of something, you find ways of squeezing the cost to a bare minimum, which is usually just a bit more than the cost of raw materials. Sub-miniature tubes were used by the military, but were too expensive to make for use in AA5 type radios. See my web page for speculation on how such a radio might have taken shape. The end of the AA5 radio was in the early 1970's, as stocks of tubes and related parts were depleted by manufacturers and sellers. By then, many were made in Japan, and Japanese AA5 tubes were also made in Japan used by American radio and TV manufacturers. After that, solid state radios, many using a high voltage audio output resistor and thus were also "hot chassis", became the preferred technology. 56R9      150 mA compactron triode/ power pentode tube, early '70's? NOTE: Not all subs will work in all circuits!